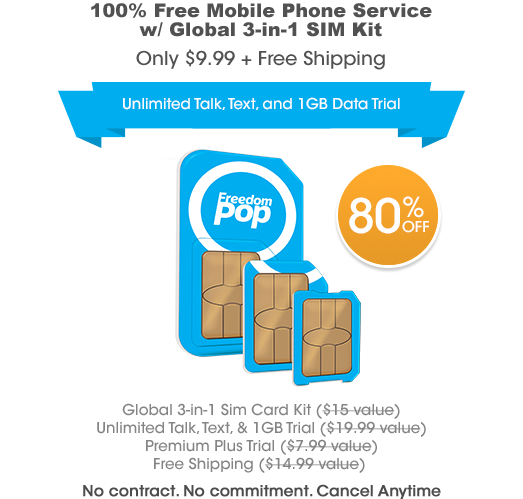 **DEAL ALERT** 3-in-1 SIM Kit w/ TALK, TEXT, & DATA for ONLY $9.99 + Free Shipping. Compatible with most unlocked GSM AT&T and T-Mobile phones, Don't miss out on this HOT deal and the ability to use your device around the world; currently 25 countries with more being added! Click here for more details! *While supplies last! LG Optimus G? LG-E980 @Jorge M.? Can I use on this or any other deal? Son passed it to me when he upgraded. Hi Jorge. As you instructed, I refused the package (Order #47877506). Please issue my refund. Thanks! I purchased this and it arrived today and I installed it in my iPhone 4s but I can not get out to the internet? I get bars and AT&T 3G at the top and I even put in the APN like the the start guide states you might have to do but it still comes up and says "Could not activate cellular data network"? What am I doing wrong? Same problem for me! Please fix this FreedomPop! Yep, mine also started working around 2am and woke me up. But I am glad to see they fixed the problem as it has been working fine all day today. Since it was a new SIM I had just received yesterday I was not sure if it was a SIM issue or not... Now I know..
Is Colombia going to be added as one of the countries this will work in by chance? I would like to know why I can't even purchase this deal without a new email address. When I log in and try to claim this deal, the url displays an error, and the page itself just appears to reload with the exact same "Get Offer" button. When I use a new email, it takes me to the checkout page. I really really hate how freedompop handles their website and how in order to get anywhere, you need a new email address. It makes so very little sense. I would like to purchase this, but it seems you guys really do not want anyone's money, just email addresses. Hello, How will this Global Data SIM work in the Commonwealth of Dominica? There are 2 local mobile providers, FLOW (formerly known as LIME and Cable & Wireless) and DIGICEL. How would I get the 1 GB of free data from one of them? Is there still an outage with the Global Sim / Global Hot spot? I received my device on Friday and it work up to the outage and has never pulled an IP address since Friday afternoon and now its Sunday and it still does not work. Hi Jorge. I received my refund for my returned duplicate order, Order #47877506. Was the account connected to that order fully deleted so that we won't accidentally be charged a monthly fee? Thanks! I am a little confused, Is this Global SIM card still on Sprint Network? or on ATT/TMobile? In the US, it connects to AT&T and T-Mobile. I'd like to get one of these, but I see they're temporarily sold out. Does anyone know when more will be available? Hi Jorge. I refused the delivery of this(order #48308130). Please issue me a refund. Thank you! How long will it take to be processed? Edited: Sorry, decided to keep the account. All is good. Got shipped Email in the evening. Checked Fedex Website , Label was created Monday noon. Mine just arrived today, but like @DigitalKnight and @Tyler Hochleutner experienced last weekend, I'm getting the full bars of AT&T 3G showing, but no connectivity. Is there another outage at the moment? Do I just need to wait it out? I am only getting 3G how come I can't get 4G? I am only getting 3G. I had Enabled my 4G on data like it said in the instruction for iPhone and still not getting 4G? Also it is eating my data like crazy every time I opened my browser to surf. I further looked into FP offer, it say supports HSPA+ and 3G, so there is no LTE support on this SIM kit. "What networks does FreedomPop run on? It runs on HSPA+ and 3G networks." Does your phone support HSPA+ would be the question then? Another would be are you in an area that has HSPA+ available (assuming your device supports it)? I've been waiting for FreedomPop to do a free GSM plan so I could use an Amazon phone with it. Now that it's here and available, but there's no FreedomPop Messaging app in the Amazon App Store! Has anyone tried this with an Amazon Fire Phone? If so, how did you do it and how well does it work?